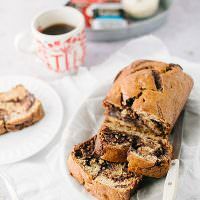 I have posted this recipe on my photography blog before but thought that I would share it here because it is a favorite of mine. I love anything lemon. Sweet, savory, lemon does it for me. 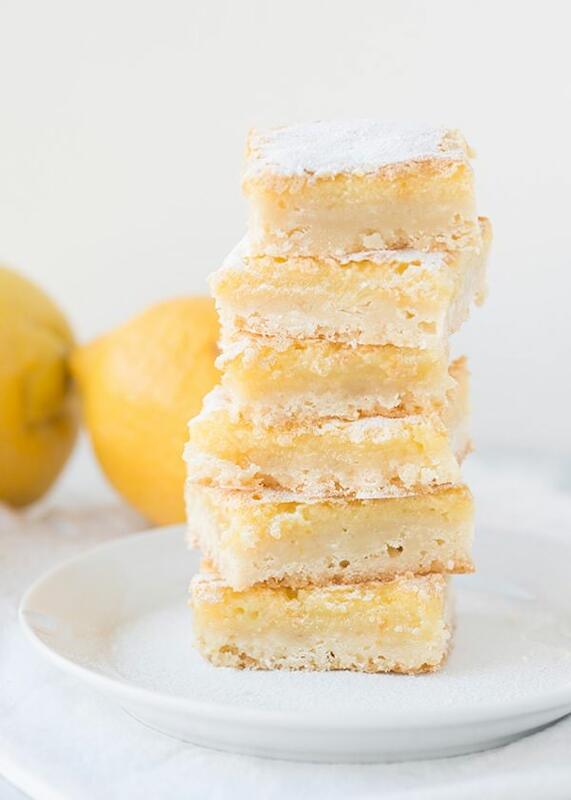 These lemon bars are one of my favorite desserts on the planet and completely remind me of my mom. When I had my oldest son she came to my house to take care of us and these are the first thing that I asked her to make for me. I love them. They are easy to make, hold well, and freeze like a dream. I usually cut the squares pretty small and freeze half a batch for another time. I make these in my Cuisinart but you can easily make them by hand. That is what Martha would do. But as we all know, I am no Martha. Also, had a bunch of gorgeous Meyer Lemons laying around and wanted to use them up. They made these a little sweeter than I would have liked. 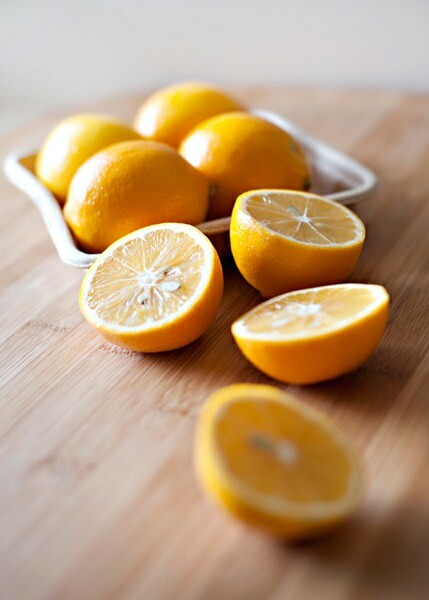 If I were to use Meyer Lemons again, I would have definitely reduced the amount of sugar in the filling or cut it with some full strength lemon. I loved the bright yellow color that the Meyer lemons gave me, but these are supposed to be on the tart side. Preheat the oven to 350 degrees. Spray a 9×13 pan with cooking spray. In a food processor, put the dry ingredients in the bowl and pulse. Add the butter and pulse until it turns into the size of peas. Press the crust into the bottom of the pan. Bake the crust for 20 minutes. Let the crust cool a bit and start on the filling. 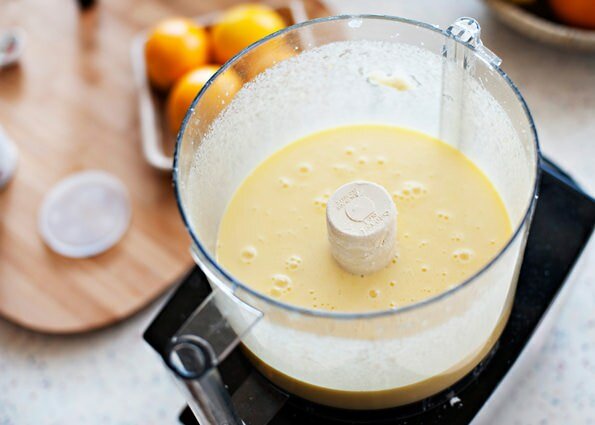 Put all of the filling ingredients in the bowl of the food processor and process until smooth. 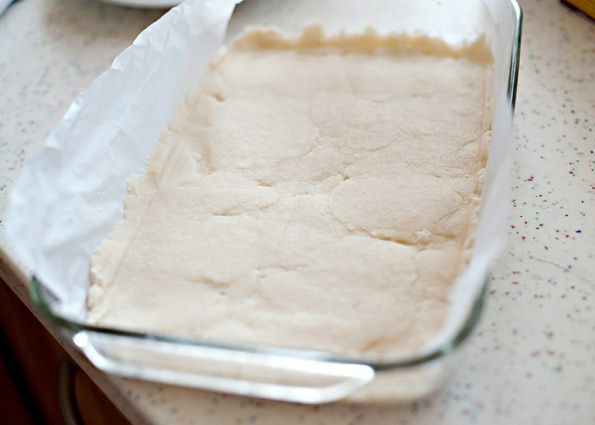 Right before you are ready to pour it over the crust, add the baking powder. Give it one more whirl and you can pour it in. Pour it gently on top of the crust or the crust can break. Bake the lemon bars for another 25 minutes or until the lemon filling is set. Cut into squares and share with a friend. The recipe calls for two sticks of unsalted butter. Not sure what is meant. I know it is not a pound of butter. I have never bought butter in sticks. 1 cup, or 1/2 pound. I have limes dropping off of my trees these days and this recipe inspires me to whip up some lime bars! Thanks!!! They look good enough to eat! My favorite, too! Great website, I’ve been sharing it with my friends. You’re amazing! I love lemon bars! I must try this recipe out. I love that it can be halved easily. 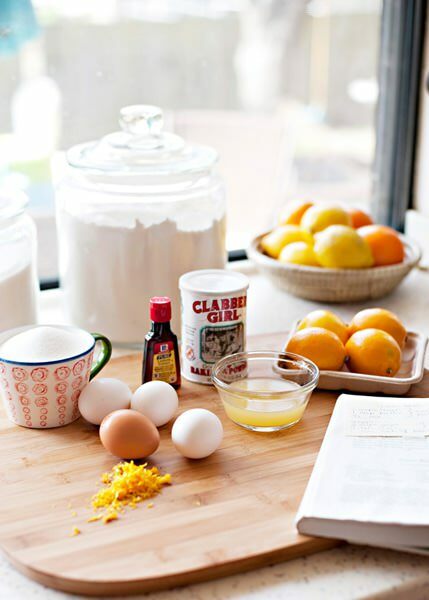 I sometimes add it, I figure you can never have enough lemon, but the recipe really does not call for it. Bree, these sound delicious. I just bookmarked the recipe. I want to make them for my son when he comes home next week for spring break! Your photography is absolutely stunning!! these look AMAZING!! cannot wait to make them! I just made these this morning! Mine did not look anywhere near as gorgeous as yours do! The recipe seems the same, apart from the baking powder which mine didn’t have. I did not get the lovely separate layers though. Any idea what I am doing wrong? I think I will make these for Easter! Thanks, Bree! Hey Bree, I made these again the other day, following your tip to wait for the crust to cook before adding the filling. I got the separate layers (hooray) but it somehow became an upside down slice in that the gooey lemon layer ended up on the bottom and the crust on the top. Help! I am not normally so incompetent with baking…just this delicious little slice has me beaten into submissive cowering! I had the same thing. How do you keep the lemn on top? I am not sure what you mean. Did you let them cool completely? If the crust isn’t fully cooked, it rises to the top and the lemon goes to the bottom. YOU ARE AMAZING!! I cannot believe you find the time to be successful at so many things. This website is visually stunning, not to mention the recipes look yummy. 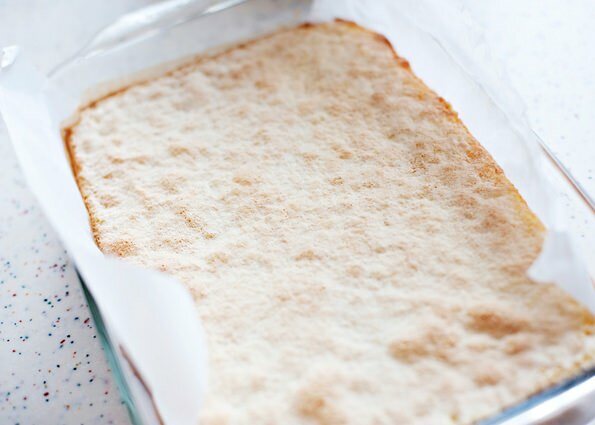 I went shopping today and plan on making these lemon bars tomorrow. Also, I am Italian and grew up with Limoncello, so I hope to make that in the near future too. I made these yesterday, and they were so lemony and delish! Perfect balance of lemon filling and crust, and not sticky-sweet at all. Freshy, lovely & lemony! Can these be frozen to serve a few days later? I am making mutiple baskets of bar cookies – lemon bars were a request – and I will need to freeze them in order to have enough made for the order! They will be going to school teachers lounges! I really love the tangy taste. I like lemon flavor as well. I am fond of tasting new foods and trying them myself. 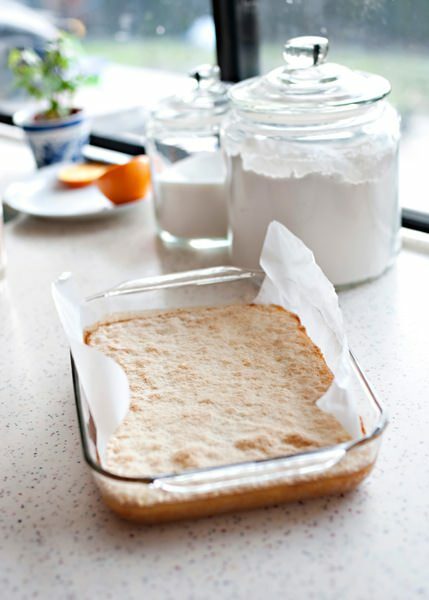 The lemon bars look amazing in the images, I don’t know if they will look the same . The recipe is put on very well. 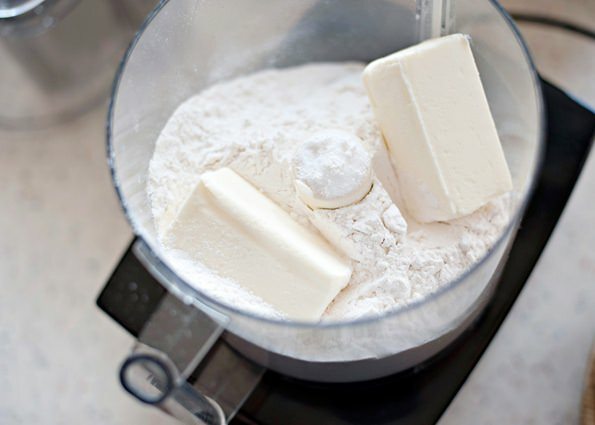 Use a mixer or by hand. 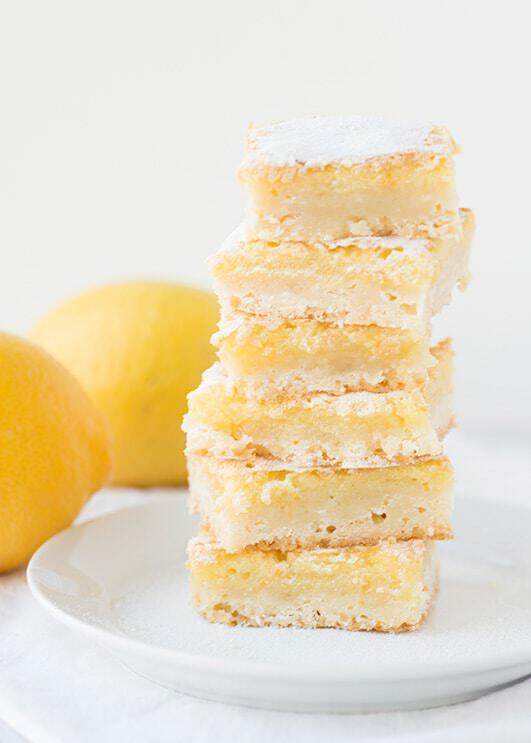 Your bars look absolutely perfect with that lovely thin lemon layer – divine! I am sorry that you are disappointed, but that is exactly what the picture looks like. I saw this comment, and decided to change it up a bit because I also like a lot of the lemon filling. I did the crust per recipe, and did 1 and 1/2 the recipe for the filling. Turned out great! do you ever freeze your lemon bars? what’s the best way and does it work? i just need to keep them fresh for the next few days. All the time! It is my favorite way to eat them. I have never made anything like this, so how do you know when the lemon is set? Do you use plain flour or self rising and it the top suppose to have a thin crust? It will not jiggle and the top will crust over. Always regular flour, I never use self-rising. The filling/crust is about 50/50. Making these yummy treats today!!! You introduced me to my first lemon bar 8.5 years ago! Hope they turn out like yours. I am so glad that you liked them so much Hannah! These are so good and easy to make. I will try extra lemon and maybe zest next time to add even more lemon flavor and tartness. This will be a go to recipe for me. Thanks! I am so glad. Love this recipe. These look fabulous and are perfect for the cookie/square exchange I’m doing. Just wondering how many this recipe makes?? A 9×13 pan, so you can cut it into as many pieces as you like. Could you tell me how much 2 sticks of butter is? in grams or cups or whatever is used for butter in the US =) I’m planning on making these for easter! Wow — those look absolutely gorgeous! Can you tell me why baking powder goes into the filling though. Some recipes use it, others do not. I would like to know what purpose it serves? Thanks so much! I think that it makes the filling make a crust of sorts and help it set. These were great except my crust was too crumbly and just fell to bits, I think it was the spray I used though, it had flour in it. My pan was dark and I ended up having to adjust the temp, but I added zest and more lemon juice and some Doterra oil lemon to the filling I was worried it might be too much but it was perfect the lemon taste we all wanted thank you Bree. 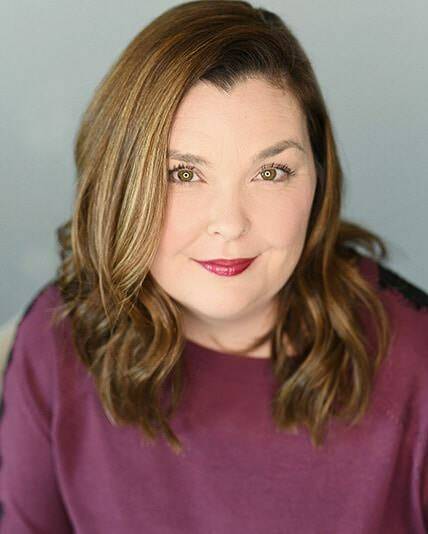 My family and I love your recipes.